Just a quick note from me to thank you for participating in our ‘virtual AGM’ – I know it is a bit of an unusual system but it suits our geographically diverse nature well and we seem to have pretty good participation in the process (though I really encourage those voting members who did not participate to do so next time!). Thank you all for the many useful hints, tips and suggestions I regularly receive on how to make things smoother within the project (keep them coming!) – hopefully we will get into a steady routine with this governance now. We have been going through a lot of ramp up trying to get templates, processes, etc in place as we switch over to QGIS.ORG legal entity etc. We appreciate your patience while we figure things out – and a very big thank you to Andreas Neumann and Anita Graser who have pitched in with a lot of administrative work behind the scenes to help get the QGIS legal entity in place! What’s next? I will be starting the nomination process for 4 new community voting members, soon (one to match each of the incoming country user groups for Norway, Sweden, South Africa and France). At the end of that process we will have 31 voting members. Soon QGIS.ORG will be in the Swiss Trade Registry, which means we can be VAT registered, can take ownership of the QGIS.ORG trademark (which is currently held in proxy for us) and of course present ourselves as a well governed project, hopefully attractive to large funders who recognize the global good a project like QGIS does! With QGIS 3.0 moving closer, it is also time to get the new QGIS logo out there. We are therefore asking all our user groups to join the project redesign efforts. Please have a look at your user group logo and bring it in line with the QGIS 3.0 design. We are looking forward to seeing all your creative efforts! Note that each voting member was allowed 6 votes, but was not allowed to vote for the same person more than once. For the Board Member positions, which were specifically named, the candidate with the greatest number of votes for each role assigned that role. The PSC member positions were calculated based on the total number of votes each candidate received (including those allocated to named board roles). In accordance with our statutes, Gary Sherman remains on the PSC on a permanent basis as Honorary PSC member. Election of the board chair was carried out as part of the general voting process. The successful candidate was Tim Sutton. There were no matters brought forward by voting members. If you have any queries about the QGIS Governance processes, please do not hesitate to ask! It is our pleasure to announce that the QGIS.org voting members have unanimously agreed to the adoption of the proposed new logo. We are currently planning the roll out of the new logo to all our applications, web platforms, and social media accounts. In addition, we will create marketing material with the new QGIS branding. Since this is a volunteer effort, we are planning to approach this step-by-step. The goal is to have everything ready by the time of the QGIS 3.0 release. If you are interested in helping with this effort, please leave a comment here and we will get in touch! 2016 was an exciting year for us. It was a year with three great releases (2.14 LTR, 2.16 & 2.18), lots of developer and community events (including our 2nd user conference in Girona, the developer meeting in Bonn before FOSS4G & a QGIS Server sprint in Lyon) and many firsts, including the first round of QGIS grants and our new QGIS.org organizational structure. Thank you for helping us improve the QGIS experience for everyone! If you are following this blog, you are already aware that we have even bigger plans for 2017, including but not limited to the big QGIS 3.0 release and a completely overhauled QGIS logo. We’re looking forward to another great year with the QGIS community. If you have been following this blog and the QGIS community discussions, you will know that 2017 is going to be a big year in the history of QGIS since we are planning the release of QGIS 3.0. One of the requests we had during our Girona Hackfest held earlier this year was to come up with a fresher logo for QGIS. Some of you may remember that we had an abortive attempt at coming up with a new logo a couple of years ago. We found that process quite difficult to manage since we tried to do it in a completely open way and there were so many differing opinions, varying tastes and so on that the whole process reached an impasse and we decided to shelve the idea for time being. With that history in mind we decided to approach the logo updating process for QGIS 3.0 differently this time around and use a professional designer to come up with a design and then provide the QGIS Voting Members with a simple, binary YES/NO choice as to whether they accept the new logo or not. The first (left) and second (right) generations of the QGIS logo. If possible, keep element(s) from the current design. It is important for the new logo to try to retain some of these elements (Q, arrow, colors, …) so people can still recognize the QGIS brand. While retaining the traditional yellow and green, the addition of a new third colour is a nice play on version 3.0. In addition, the old arrow is now a more natural part of the Q and there is a version designed to spell out QGIS. Although the budget for the grant programme was €20,000.00, the total amount for the three winning proposals is €20,500.00 – an additional €500.00 was made available by the PSC towards the grant programme to accommodate this. As mentioned in our previous blog post about this selection process, this is the first time that we have asked our newly formed group of QGIS Voting Members to vote. It is extremely gratifying to see such enthusiastic participation in the voting process. Of the 27 voting members, 24 registered their votes. There was one late submission that unfortunately had to be excluded, and 2 non-votes. Details: I am applying for a QGIS grant to cover the implementation of a flexible “properties framework” for QGIS. I honestly believe that implementation of this framework will unlock cartographic power in QGIS well beyond anything that is currently possible in any of the desktop or web based mapping applications. I propose to implement a system of managing and evaluating properties for generic objects within QGIS. Properties include all settings relating to symbology, such as a line marker’s width, color, or offset, label settings (eg font size, color, shadow opacity, etc), diagram properties (colors, size, etc) and composer item settings (position, rotation, frame size and color, etc). While currently many of the properties can be set to use “data defined overrides”, the properties framework will extend these capabilities by making them both more flexible and easier to use. 1. To avoid the current multiple duplicate code paths involving storage, retrieval and evaluation of data defined properties and to make it easier to add data defined support to more things (eg diagrams) without incurring even more duplicate code. Currently labeling, symbology and composer all have their own methods for handling data defined properties, which makes maintenance of data defined code very difficult. 2. To allow creation of other property types besides the current “data defined” (ie bound to field value or expression result) property, eg time based properties for a future in-built animation framework. 3. To avoid the complexity of requiring users to write their own expressions to map values to colors, sizes, etc and apply scaling functions to these, and instead expose these to users in an interactive, flexible way. 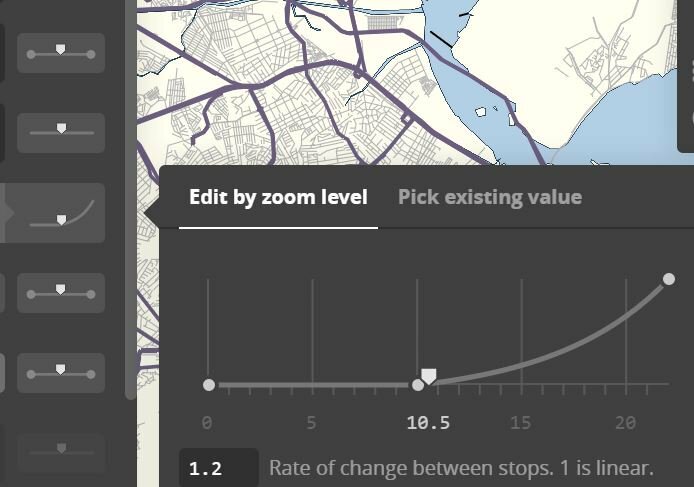 Think Mapbox studio’s approach to zoom level styling (https://cloud.githubusercontent.com/assets/1829991/17850412/6a0f285e-68a0-11e6-8719-cdf74afd061d.jpg), but available for all property types. Eg data defined values can be set to preset ease in/ease out curves, or manually edited curves through an interactive GUI. 4. Enable the possibility of having live project wide colors. Ie a color palette could be created in the project properties, and color based properties “bound” to these colors. Altering the color would then automatically update every property which was bound to this preset color. This also brings the possibility of “color themes” for maps, eg binding properties to a predefined color types such as “highlights”, “background features”, etc, and then interactively changing all these color bound properties by applying a color theme to the project. 5. To allow a system of inherited and overridden properties. Eg QGIS default label font overridden by a project default font and finally overridden by label font setting. The proposed composer rewrite (layouts work) would use this property inheritance to bind layout item properties to a dynamic template. Changes in the template would be reflected in all linked layouts, but individual items could overwrite the inherited properties as required. Layout item properties could then be set globally (eg, font size), per project (eg font family), via a “master template” and finally individually per layout item. 6. The labelling engine has a need for predefined label styles. Label properties could be set globally, per project, via a predefined style, or overridden for a particular layer. Technical details regarding this proposal are available in QEP 22 (https://github.com/qgis/QGIS-Enhancement-Proposals/issues/38). History: Because I believe so firmly that this framework is required within QGIS, I have been building toward this work through numerous hours of development over the previous 2 years of QGIS releases. There were a number of prerequisite changes required first, such as the implementation of expression contexts. An initial PR (https://github.com/qgis/QGIS/pull/2857) for the properties framework was filed in May 2016, which includes some of the core parts of this proposal. Changes were required based on feedback from that PR , however to date all work on this has been on a volunteer, unsponsored basis and unfortunately I am no longer able to complete such large scale changes as are required by this proposal without funding. Aside from the changes required from the initial PR, significant work remains in implementing GUI, unit tests, and porting symbology and labeling to the new framework. Qualifications: I have an extensive history of large-scale contributions to QGIS since 2013 and a proven track record for writing polished UI with extensive unit testing. I’m passionate about QGIS, being a daily GIS user and strongly believe that this framework is required to take QGIS to the next level of cartographic abilities. Implementation Plan: Due to the extensive refactoring and API changes which are required for implementing the properties framework, this work MUST be done in the QGIS 3.0 timeline. If it is not completed during the 3.0 API break period, the amount of work and cost required would substantially increase, and numerous methods across the symbology, labeling and diagrams API would be deprecated. Accordingly this work will be conducted during the QGIS 3.0 timeline, and for greatest testing I would aim to complete the work ASAP (likely complete by late October). Due to the changes required this work would NOT be suitable to backporting to the >= 2.18 branch and will be targeted at QGIS 3.0 only. Details: For QGIS3 we need packages of Qt5, PyQt5 and Python 3 (including many extensions currently available for Python 2). The goal of this proposal is to introduce all required dependencies to OSGeo4W (32&64bit) that are necessary to build and package QGIS3. The requested amount will cover 60h of work on this. History: I also did the packaging of Qt4, PyQt4 and QGIS. I’ve also already started to build and package Qt 5.7 using Visual C++ 2015. Implementation Plan: I plan on doing it this in Q4 this year to have it available for the release and I don’t expect significant extra effort to support Windows (ie. if the issues are solved on a platform that already has Qt5 and friends available it should also work on Windows). 1. Avoiding UI blocking tasks, allowing users to continue working while the task is completed. 2. Simplify background task threading for plugin, processing algorithm (and core) developers by exposing a simple API for creating and scheduling long running tasks. 3. Benefit from the stabler code which comes as a result of having a single, well tested implementation of background threading rather than multiple custom implementations of this code. 4. We “catch up” to our commercial competitors (ie ArcGIS and MapInfo Professional), who currently have inbuilt background threading of long running tasks already available in their software. This work was begun in https://github.com/qgis/QGIS/pull/3004, however significant changes are still required before the task manager can be merged into QGIS. It is vital that the task manager implementation is rock solid and with a future proof API which addresses our needs for the 3.x release cycle. 1. Building off the work started in the pull request, first addressing the feedback received from GitHub and from direct conversations with interested stakeholders and stabilising the API. 2. Completion of the unit tests to cover all parts of the framework. 3. Polish the GUI for interacting with running and completed tasks. 4. Writing documentation for the Python cookbook demonstrating how the task manager should be used from Python code. Qualifications: I have an extensive history of complex changes to QGIS code, and am currently one of the most active QGIS core developers. I have a track record of implementing stable, heavily unit tested code and supporting code I write for extended periods. I am also a daily user of QGIS as a GIS software application, so am invested in making the software as powerful, stable and easy to use as possible! Implementation Plan: This work would be completed ASAP to allow for lengthy testing prior to the QGIS 3.0 release, and to allow the maximum time possible for developers to adapt their code and plugins to the new task manager interface. As many of you will be aware, in this last year we have been embarking on the process to transition from a loose-knit community organisation to a more formal organisation. This new organisation ‘QGIS.org’ will be a legal entity and will afford us a greater amount of flexibility in how we manage funds, legal agreements and so forth. You can read the statutes for the QGIS.org organisation for more info. 1) The Martian user group puts forward Joe Alien to be their QGIS User Group Voting Member. 2) QGIS committers put forward nominations for a matching Community Voting Member from within the community. Community member with the highest number of nominations is elected. Only people with git commit rights to an official QGIS repository or write access to the QGIS translation platform on transifex can put forward nominations. The nominated person can be any person from within the QGIS community who is willing to serve as a voting QGIS community member. 3) The Moon user group puts forward Janet Luna to be their QGIS User Group Voting Member. 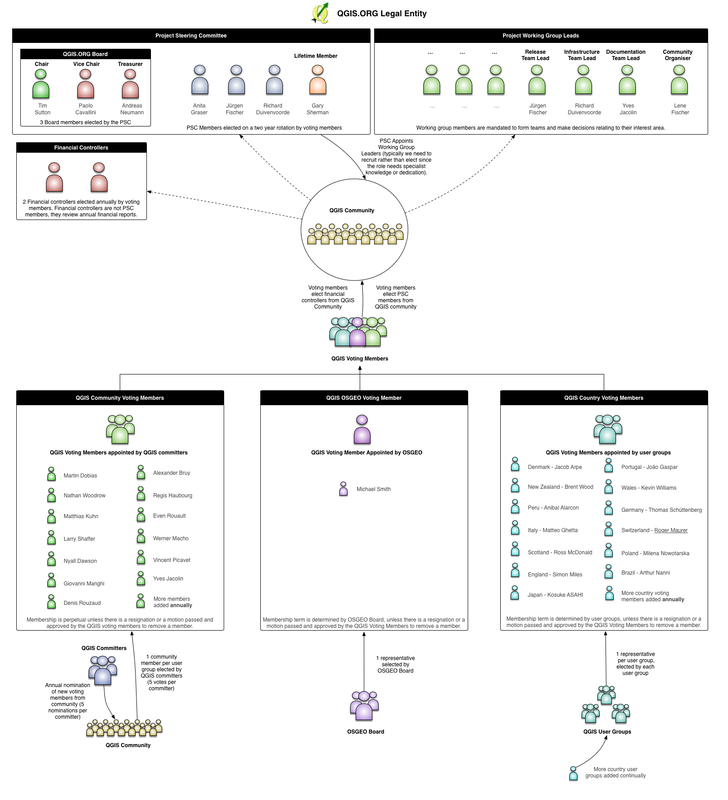 5) OSGEO puts forward one person to act as the OSGEO voting member. Voting members will elect the QGIS Board, Board Chairman and approve budgets and the annual report. Once elected, the board will make day to day decisions on behalf of the project as needed. The OSGEO voting member will also serve to ensure that there are always an odd number of voting members to avoid deadlocks. Voting members will have their continued membership confirmed on a 3 yearly basis. Since we are bootstrapping the QGIS.org organisation, we have not yet elected any voting members. Currently there are 10 QGIS User Groups registered (this number may be different when you read this due to new registrations), thus we would like to invite all people who have Git commit access to any official QGIS repo, or transifex write access to make their nominations for their community voting members. The 10 consenting nominees with the highest number of nominations will be appointed as community voting members. We will close the nomination period on Wed 11 May if at least 10 unique persons have been nominated, otherwise as soon as 10 unique persons have been nominated. We will maintain a list of the QGIS Voting Members on the web site for public viewing. After all of the voting members have been elected they will be asked to elect the members of the board. Board members need not be voting members, any QGIS community member can be elected to the board. For formation of the new board, existing PSC members will automatically be nominated and the community voting members can also put up additional nominations. We would then put the election of the board members to a vote (maintaining the same number of members as are currently in the PSC for now). Once the board has officially been elected, the voting members can then select a chair for the board. Note that all voting will be done electronically via an online form. By this process we will have a democratically elected board entrusted with stewardship of the new QGIS.org Organisation. Each year we will hold an annual general meeting and voting members can elect a new chair, or re-elect the existing chair. Similarly on a rotational basis, board members will be up for re-election each year. If things are a little unclear above, I have made a simple diagram which hopefully clarifies things (see below). Note that Gary Sherman (QGIS project founder) is board member emeritus and this will not be up for re-election as he has life long tenure on the board. So if you are eligible to nominate voting members (i.e. you are a committer on any official QGIS repo or a Transifex author), please head over to the form provided to make your nomination!